Inspired by every baby and informed by the lastest research on how babies learn and grow, eebee’sadventures products are designed to help you and your baby transform everyday play into learning that lasts. 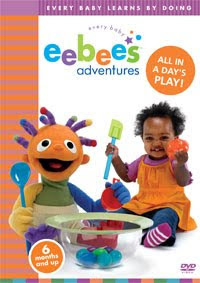 eebee’s adventures are designed to engage you and your baby with rich play experiences that provide powerful lessons that memorizing letter, numbers, colors and shapes simply can and do not. Watching and, importantly, “doing” eebee’s adventures will allow you and your baby to see and learn first-hand what happens when you explore a crinkly, crunchy, smooth and bumpy paper mountain or roll, bounce, pop, bang, slide and toss your way around a world of balls and ramps. 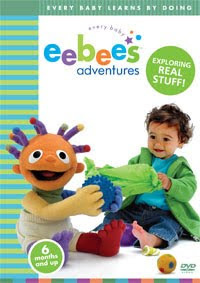 eebee’s Exploring Real Stuff DVD – This DVD teaches children to feel the texture of different things. The children in the video play with Cheerios and Rice and learn to fill bowls up and to dump them out. They learn about the many things that can be done with paper, such as ripping. This DVD teaches children to experiment in order to learn what can be done with different objects. This is the perfect DVD to teach your young child to explore and make sure they have fun while learning. We love this video it’s so intelligent because it’s based on real play between parents and children. We now have a big container of cheerios to play inside on the living room floor. Iv’e actually seen my kids progress in their skills by doing the eebee activities in the video. 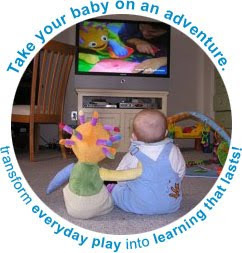 eebee’s All in a Day’s Play DVD – Is the “event” oriented DVD that celebrates those simple moments of the day where baby plays and baby learns! 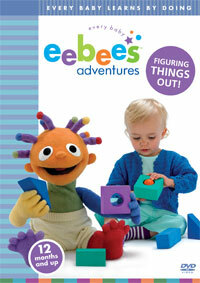 Kids can watch eebee playing in and around the laundry basket, making music with pots and pans, and more! This video is great for real play with your baby not just staring at images. We can use the play ideas without the video too. It’s not about learning numbers or letters but about how your baby can learn things by experiencing them – with you. I think it’s very intelligent. eebee’s Figuring Things Out! DVD – This DVD was filled with fun things to do with your toddler. In the beginning there are piles of pillows on the floor and the lady hides the ball in different places around the pillows and asks Eebee to find the ball. This not only teaches a child how to look for different objects but also teaches coordination when moving things around. This video also teaches childre how to turn lights on and off, including flashlights. One of my favorite parts was when they focused on shadows. This is an adorable way to enrich your child’s mind and the best part is, your child can use these skills in everyday life for the rest of his/her life. 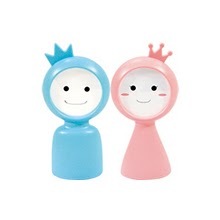 * Give your child toys or items similar to the ones shown in the videos so they can play along with eebee. *Set up similar games and situations to play with your baby or toddler. *Sing the catchy ”eebee’s” theme song to your baby. It will be stuck in your head anyway, and it will help your baby learn babbling sounds. *Let your older children watch “eebee’s adventures” and you might be surprised to see them modeling the idea in the video when playing with the baby. Visit eebee’s to learn more about the videos and to see all their eebee’s products like toys, books, clothing, music and gifts. The videos are $14.95 each. I would recommend these videos to moms with babies 6 months and up! via Mother of 1 Princess and 2 Princes: HOLIDAY GIFT GUIDE EEBEE’S DVD’S REVIEW & GIVEAWAY.